Opening day 1993, Paul, Joe, Michael and I finished our annual breakfast and teamed up to head for our hunting spots. Paul and Joe headed for their hunting land as mike and I got in the truck to do the same. We arrived in our stands early. By eight o'clock I saw two deer moving nervously through the thicket below me. At ten o'clock my frozen feet needed a quick walk. As I walked to the edge of the woods a doe jumped up and wandered into the thicket. Cautiously I entered the field and scanned it for movement. Maybe a buck trailing that doe. At first glance I saw nothing. I took a few more steps and ...WOW! About 400 yards away, was what looked like the King Kong of whitetails. I sank low in the grass and for twenty minutes watching this impressive buck strut his stuff as he occasionally charged the smaller deer. Then he disappeared into the thicket. I wasted no time getting to my brother Mikes stand. He was already out of his tree and asked if I had jumped a doe at the edge of the woods. Mike told me he had watched the buck chase does for more than an hour, but he had never gotten close enough for a shot. I figured this would be our deer story for the year. The big one that every hunter sees, always too far to shoot at and of course, is never seen again. We talked about what we had observed and thought this buck must feel very safe here by the show he had just put on. That was it for day one. Tuesday, after work, I watched the area from Mike's tree stand. Just before sunset the appeared 400 yds away feeding. But, time didn't allow for a stalk. Day three, after work, i climbed the same tree hoping the buck would appear on schedule. As I settled in to my stand, I heard a "snap" from the under growth below. Two does and a fawn wandered and fed below me. "Should I fill my permit?" I asked myself. Moving only slightly to scan the area my eyes locked on antler movement further out. There he was again. I chose to wait for him as the does and fawn walked away. He never advanced. It got dark. I went home. Thanksgiving morning, a traditional half-day hunt, had me sort of frustrated trying to figure out how to get into this bucks yard undetected. Given the lay of the land, I chose not to invade. Instead I decided to climb treestand #2, and see that buck again. It was twenty degrees and the sky was clear. I studied the area where the big guy was hanging as the sun rose. I thought, "What a beautiful morning. Hey, there's a deer. Hey, it's a buck. It wasn't the big one , but at 400-500 yds its a good one. I should watch the thick stuff 30 yards behind me. Hope I can fill my permit. Maybe the buck will cross the field in my direction." It was 7:20 am the third time I looked behind me toward the heavy brush. What to my wandering eyes should appear? A huge set of horns on a very big deer. Because of a large tree limb, I couldn't position myself to shoot at that angle. I turned away from the buck hoping he would walk by me. There was no wind at all and I could hear each hoof step as the buck approached. Now the adrenaline pumped and buck fever started to set in. It was perfect, the buck walked right by never detecting me. The problem now was the buck fever. Deep breath, aim, BOOM! The deer runs, BOOM! BOOM! Empty gun, deer stops and looks back as if to say, "What was all that about?" I have time for one more shot before he disappears over the knoll. I felt the recoil of the Remington 870 as I heard a loud slap and watched the buck drop in his tracks. I waited, watching intently. There was now movement in the grass. As I approached the area where he fell I could smell rut. Ten yards from me lay the monster buck. As I kneeled beside him I was in awe of the frost covered antlers, glistening as the sun hit them. A few words with the Lord and a Thanksgiving I will never forget. 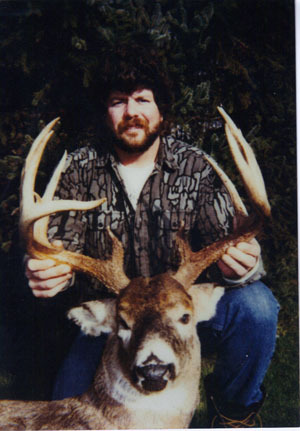 Dave's Onondaga County buck scored 162-1 B&C and is officially entered in the New York State Big Buck Club.